North-east of Medina, the ancient and wealthy town of Khyber was the seat of the Jewish power in Arabia: the territory, a fertile spot in the desert, was covered with plantations and cattle, and protected by eight castles, some of which were esteemed of impregnable strength. The Jews were not only the best farmers of the country, they were also its leaders in industry and business. In the times of the Prophet Muhammad, the best arsenals of Arabia were all in Khyber. The Jews, who had been banished from Medina had resettled in Khyber, were the best metalworkers, knowing the art of beating out the splendid shining armor, the moon-curved swords and sun-catching helmets that glorified warfare in the desert. The Jews of Khyber heard about the Treaty of Hudaybiyya and its terms. Just as the Quraysh in Mecca and Umar bin al-Khattab and some other Muslims in Medina had interpreted the treaty as the surrender of the Muslims, so also did the Jews of Khyber consider it a sign of the incipient decline of the power of the State of Medina. So they began to instigate the Arab tribes between Khyber and Medina to attack the Muslims. One of these tribes was the Ghatafan, the allies of the Jews of Khyber, who began to send their raiding parties into the pastures around Medina. One such pasture belonged to the Prophet Muhammad himself. Once, when the son of Abu Dharr al-Ghaffari was grazing the camels of the Prophet, the Ghatafans attacked and killed him, captured his mother who was with him, and they drove with them the herd of camels. The Muslims, however, were able to overtake the attackers and rescued the wife of Abu Dharr al-Ghaffari. Muhammad then decided to put an end to these provocations. He thought that it would not be prudent to wait until the Jews and their allies laid siege to Medina, and that it would be better to forestall them. He, therefore, ordered the Muslims to prepare, and to march on Khyber. In September 628 the Prophet left Medina with 1600 soldiers. The city of Khyber, strongly defended by eight fortresses, was deemed impregnable. The strongest and the most important of them all was the fortress of al-Qamus. The captain of its garrison was a famous champion called Marhab. He had, under his command, the best fighting men of Khyber who were the best-equipped soldiers of the time in all Arabia. Muhammad began the campaign of Khyber by laying seige and capturing individually the minor strongholds. When this was done, he marched against Al-Qamus, the main fortress of Khyber. It was a formidable looking place with frowning walls built out of the living rock. All accesses were strongly fortified, and within the ramparts was a well-equipped and well-provisioned garrison. Siege warfare was unfamiliar to these nomads accustomed to desert raiding. However, Mohammed had a number of improvised siege engines put together on the spot. The most effective of these were palm-trunk battering rams which, eventually, made a small breach in the walls. Muhammad sent Abu Bakr at one time to lead the assault, bearing the standard of the Prophet; but, after fighting with great bravery, was compelled to retreat. The next attack was headed by Omar ibn Khattab, who fought until the close of day with no better success. These repeated failures began to undermine the morale of the army. Muhammad realized that something dramatic had to be done to restore the wilting morale of the Muslims, and he declared: "Tomorrow I shall give the banner of Islam to a hero who loves Allah and His Apostle, and Allah and His Apostle love him. He is no runaway. He is one who attacks the enemy but does not run, and he will conquer Khyber." The companions knew that the prediction of the Messenger of Allah would come true, and that Khyber would be conquered on the following day. Everyone of them, therefore, became a candidate for the glory and honor of conquering it and so the following morning, they gathered in front of the tent of the Prophet. The Messenger of Allah came out of his tent, and only asked one question: "Where is Ali?" Ali at this time was in his tent. He knew that if he was the beloved of Allah and His Apostle, then he, and no one else would capture the fortress of al-Qamus. The Prophet sent for him. 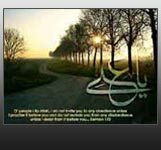 When Ali came, the Prophet solemnly placed the banner of Islam in his hand. He invoked Allah's blessings upon him, prayed for his victory, and bade him farewell. Ali then advanced toward the most formidable fortress in all Arabia where the bravest of the warriors were awaiting him. He fought against them all, overcame them, and planted the banner of Islam on its main tower. When the conqueror returned to the camp, the Messenger of Allah greeted him with smiles, kisses and embraces, and prayed to Allah to bestow His best rewards upon His lion. Ali was no giant, but he made up for his lack of height by his great breadth and prodigious strength. Today he was formidable in a scarlet tunic over which he wore his shining breastplate and backplate. On his head gleamed a spiked helmet encrusted with silver. In his right hand he brandished Muhammad's own scimitar, Dhu'l-Fiqar, which had been entrusted to him with the black banner. Again and again Jewish veterans rushed at Ali. Again and again they staggered away with limbs or heads severed. Finally, the champion of all the Hebrews, a man called Marhab, who towered above the other warriors, planted himself before Ali. He wore a double cuirass, and round his helmet was a thick turban held in place by an enormous diamond. He was girt with a golden belt from which swung two swords. He did not use these, however, and killed right and left with a long three-pronged spear. For a moment the battle paused and the combatants rested on their arms to watch the duel. Marhab, like Goliath of Gath, had never been defeated. His size alone frightened opponents before they came close to him. His barbed fork disheartened the most skilled swordsman. Marhab attacked first, driving at Ali with his trident. For a moment, Ali, unaccustomed to this form of weapon gave ground. Then he steadied himself and fenced with the Hebrew. A feint and a parry sent the spear flying. Before Marhab could draw one of his swords, Ali's scimitar had cloven his head through his helmet and turban so that it fell on either side of his shoulders. The Jews, seeing their champion dead, retreated into the city. Muhammad gave the signal for a general assault. The Muslims surged forward. Ali led the onslaught. He had lost his shield during the duel and, to replace it, had torn a door from its hinges, which he carried before him. The victory was decisive, for the Jews lost 93 men; while of the Muslims only 19 were killed throughout the whole campaign. Khyber was the first campaign in which non-Muslims were made the subjects of the Islamic State and the principles of government in Islam were defined and applied. At Khyber, the nascent Islamic State acquired new subjects and new territories. It was the beginning, not only of the Islamic State but also of its expansion. If the conquest of Khyber is the beginning of the Islamic State, then Ali ibn Abu Talib, its conqueror, is its principal architect. Khyber spelled the difference for the Muslim community between abject poverty and material abundance. Abdullah bin Umar bin al-Khattab :"We were hungry at all times until the conquest of Khyber." Ayesha, he wife of the Prophet Muhammad confirms: "It was not until the conquest of Khyber that I could eat dates to my heart's content." Until the capture of Khyber the finances of the Islamic community were precarious, and the Muhajeerin lived partly off the charity or hospitality of the Ansars. 1. Large quantities of gold and silver that the Jews had been accumulating for generations. 2. The finest arsenals of Arabia containing the newest weapons of the times such as swords, spears, lances, maces, shields, armor, bows and arrows. 3. Vast herds of horses, camels and cattle, and flocks of sheep and goats. 4. Rich fertile lands with palm groves. The Prophet had to make some new arrangements for the administration of the newly won territories. Muhammad devised a plan which became a prominent institution of Islam. To kill or banish the industrious inhabitants of Khyber would disastrous, since it was not desirable that the Muslims, who were involved in active service, should be settled so far from Medina. Moreover, they were not very skilled cultivators. So he decided to leave the Jews in occupation on payment of half their produce, estimated by Abdullah son of Rawahah at 200,000 wasks of dates. One mighty stroke of Ali's sword solved the economic problems of the Muslim community, and put an end to its poverty forever. He also put an end to the dependence of the Muslims upon a fickle and temperamental nature, to feed them, once he delivered the fertile lands of Khyber to them. Ali ibn Abi Talib taught the Muslims the art of laying siege and capturing fortified positions. He taught them how to map out the strategy of a campaign, and how to fight pitched and decisive battles like disciplined armies. Fadak was another Jewish settlement near Khyber. The people of Fadak voluntarily negotiated with the Prophet and surrendered. Fadak, acquired in this manner without any effort on the part of the army of the Muslims, is considered to be the private property of the Prophet. Earlier, when the Muslims in Mecca were very poor, Khadija, the wife of the Prophet, fed and housed most of them. Having spent all her wealth for welfare of Muslims, when she died, there was nothing that she could leave for her daughter, Fatima Zahra. So the Prophet decided to gift Fadak to his daughter as a recompense for the great sacrifices her mother had made for Islam. He, therefore, gave the estate of Fadak to his daughter, and it became her property. The Jews of Wadi-ul-Qura and Tayma, other oases in Hijaz, also surrendered to the Prophet on the same terms as those of Khyber and Fadak, and stayed on their lands. Muhammad, the Messenger of Allah, was in Khyber when his cousin, Jaafer ibn Abi Talib, returned from Abyssinia after nearly fourteen years. When Jaafer learned in Medina that his master was in Khyber, he at once went there. By a coincidence, his arrival in Khyber, was synchronized with the capture of the fortress of Al-Qamus by his brother, Ali. Muhammad loved Jaafer as his own son. Muhammad was so pleased to be reunited with Jaa'fer that he said he could not tell which was the greater- victory over Khyber or reunion with Ja'far. One year after the Treaty of Hudaybiyya, Muhammad, the Messenger of Allah, accompanied by two thousand Muslims visited Mecca to perform the pilgrimage. As per the terms of the Treaty, the polytheists vacated Mecca for three days. The Messenger of Allah rode his she-camel, al-Qaswa. He was reading the verses of the chapter called, Victory, from the Qur’an. Other Muslims were chanting "At Thy command, O Lord! At Thy command, O Lord!". Bilal went on top of the building and called Adhan – the first one in the House of Allah, and two thousand believers responded to his call. The polytheists were witnessing the scene from the heights of the hills surrounding the valley of Mecca. They had never seen such discipline before, when high-born Muslims were tamely obeying the call of a former slave nor they had seen such a demonstration of equality and unity. The vast mass of the Muslims moved as one body, and the Quraysh could see with their own eyes that it was a body in which there were no distinctions between rich and poor, high and low, black and white, and Arab and non-Arab. It was a most impressive sight and could not have failed to touch the hearts of even the most hard-bitten idolaters. And yet this demonstration in the Kaaba of discipline by the Muslims, was so unrehearsed, so spontaneous. To nothing in this world was the Arab more allergic than to discipline; but he was transformed, within a few years, by the magic of Islam. At the end of three days, the leaders of Quraysh called on Ali ibn Abi Talib, and said: "Please inform Muhammad that the stipulated time has passed and he and his followers should, therefore, leave Mecca." Ali gave the message to the Prophet. The latter immediately complied, and ordered the Muslims to vacate Mecca whereupon they left Mecca and began their long march toward home. It was at this time that Khalid bin al-Walid and Amr bin Aas decided to accept Islam. They went to Medina, accepted Islam and joined the ranks of the Muhajireen. They were both destined to become famous in later days as the generals of Abu Bakr and Umar bin al-Khattab respectively.